Semilogarithmic graph paper is readily available from many graph paper manufacturers. It consists of a logarithmic scale on the y-axis and a Cartesian scale on the x-axis (Fig. 3). On the logarithmic scale, the spatial distribution of lines is such that the position of each line is proportional to the logarithm of the value represented by the line. For example, plotting a concentration of 1.83 mg/mL on semilogarithmic paper is equivalent to looking up the logarithm of 1.83 and plotting it on a Cartesian scale. This type of graph paper is extremely useful for kinetic calculations because raw concentration data can be plotted directly without converting to logarithms, and concentration values can be extrapolated and interpolated from the plot without converting logs to numbers. For example, to determine the half-life in the preceding example, the C0 value and the time at which C = C0/2 were both read directly from the graph. If Figure 3 had been a plot of ln C (on a Cartesian scale) versus time, it would have been necessary to read ln C0 from the graph, convert it to C0, divide by 2, convert back to ln (Co/2), then read the halflife of the graph. If the rate constant is determined for this example using equation (12), the slope must be calculated. To calculate the slope of the line it is necessary to first read two concentrations from the graph and then take the logarithm of each concentration as described in equation (12). It was mentioned previously that drug elimination from the body most often displays the characteristics of a first-order process. Thus, if a drug is administered by rapid intravenous (IV) injection, after mixing with the body fluids its rate of elimination from the body is proportional to the amount remaining in the body. 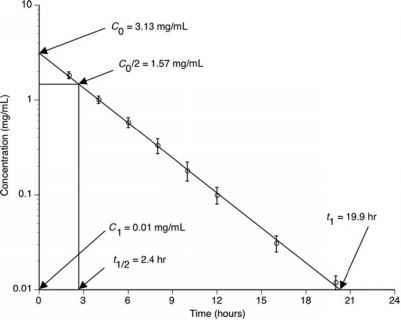 Normally, the plasma concentration is used as a measure of the amount of drug in the body, and a plot of plasma concentration versus time has the same characteristics as the plot in Figure 1. A semilogarithmic plot of plasma concentration versus time is a straight line and allows the calculation of kel from the slope, where kel is the overall elimination rate constant. The intercept at t = 0 is C?, the hypothetical plasma concentration after the drug is completely mixed with body fluids but before any elimination has occurred. A typical semilogarithmic plasma concentration versus time plot is shown in Figure 4. 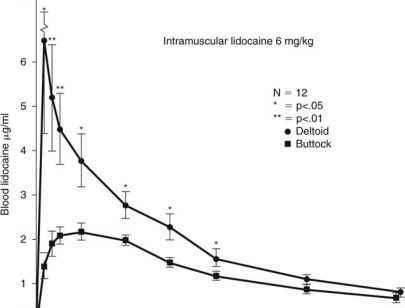 This figure shows that pharmacokinetic data can also be expressed in terms of a half-life, called the biologic half-life, which bears the same relationship to kel as that shown in equations (14) and (15). Since all the kinetic characteristics of the disappearance of a drug from plasma are the same as those for the pseudo-first-order disappearance of a substance from a solution by hydrolysis, the same working equations (equations 11 and 13) and the same approach to solving problems can be used.